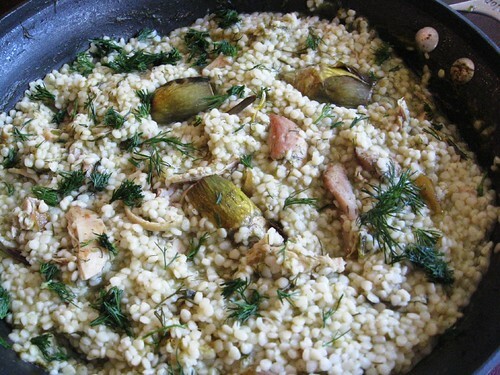 Greek cuisine has so many interesting dishes involving scallions and dill – my favorite herbs. Like this one i found in one of the books of Aglaia Kremezi. Chicken thighs braised with plenty of scallions and some white wine, braising liquid and scallions pureed and some lemon juice and dill added towards the end. The sauce is so nice – light, creamy and fragrant. One trick i learned from Jeremiah Tower – marinate chicken for several hours in a paste of olive oil/garlic. This time i made a paste of scallions and olive oil. Scrapped it off before browning, but added the marinade to the braising liquid. Served with brandy roasted baby artichokes. In the morning shredded the remaining chicken, boiled some sour trahana (greek pasta) and dump then in the warmed sauce.